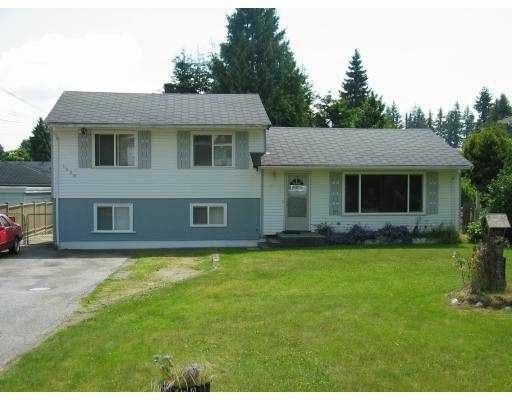 Prime Central Coquitlam location between Schoolhouse & Poirier Streets. 3 level split. Exterior with newer double glazed windows, roof, vinyl siding & stucco with vinyl paint allows for easy maintenance. Covered deck off kitchen to private backyard with access to a double garage 19 x 13 with an additional 11/6 x 3 workshop. Features: large formal living room, kitchen, dining room combination. Upstairs are 3 bedrooms. Master bedroom & 2nd bedroom have been opened up to allow for extra large master bedroom. Vendor will put back the wall if purchaser requests. Main bathroom has been totally remodelled with new cabinets, sink, faucet & tub. Downstairs is recroom, bedroom, bathroom, storage with private entry. Easy to show Monday to Friday anytime from 9-5 pm.